My newest story is a special one for me: a magical twist on a real historical event that took place near my hometown. It’s called “Roots, Shallow and Deep” and it can be read at Urban Fantasy Magazine. I was in 3rd grade when another 3rd grade class visited to perform their own dramatization of the Mussel Slough Tragedy. It was described as a local incident straight out of the Old West: settlers facing off against the greedy railroad. The kids pretended to shoot each other and writhed in death throes on the portable’s carpet. I rushed home that day, indignant. “MOM. HOW COME YOU DIDN’T TELL ME ABOUT THE MUSSEL SLOUGH TRAGEDY?” I was seven or eight then, already keenly interested in history, and I felt like she had withheld some grand treasure from me. Mom stammered out an explanation, and the end result was a detour that next Sunday to visit the site of the tragedy on our way to church. It made me even more livid when I discovered it was literally a few miles north of the house were I grew up, a straight shot on 14th Avenue. I never forgot about the tragic shoot-out that took place almost exactly a hundred years before I was born. In recent years, I’ve collected numerous books on San Joaquin Valley history through that era, some specifically about the Mussel Slough Tragedy. It remains a contentious event with lots of he-said, she-said debate. Settlers claimed that the Southern Pacific was stealing their land from beneath them; the railroad claimed the settlers were squatters. The settlers who survived the incident were later hailed as heroes by the press, like valiant knights against “the octopus” of the mighty railroad conglomerate. I figure the truth is somewhere in the middle. I made a quick visit home last weekend. Some things don’t change; on our way to church, I begged my mom to make a detour out to the Mussel Slough site so I could take pictures for my blog. The ancient house behind the marker was in the process of being torn down. 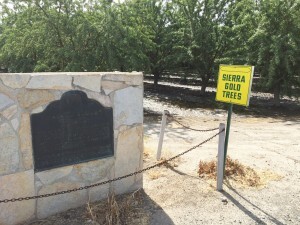 Almond trees stood in sentinel rows behind the hard-to-read state historical marker. So much of the original fight versus the railroad was because of the settlers’ efforts to irrigate the land, and to be compensated for their efforts. Now, with the drought, there was no water flowing through those ditches. Home still looks beautiful and green to me, in contrast to Arizona, but it grieves me to see how the land and the people suffer. I look at my story and how people fought to bring water to the valley, and I shake my head. Things never really change.